Each Spring, more than 1400 students from across Tennessee compete for the 230 available spots in the Tennessee Governor's School for the Arts (GSFTA). Students in visual arts, film making, and technical theater are accepted after an intense portfolio review, while instrumentalists, singers, dancers, and actors are accepted by audition only. Stewarts Creek High School is sending 21 students, a school record. No other school in the state is sending more students. The Tennessee Governor’s School for the Arts is a four-week residency summer program for high school students gifted in music, visual art, theatre, dance, and filmmaking. Governor Lamar Alexander founded the School for the Arts in 1984, assembling a team of professionals to develop a program for Tennessee that would rival the best summer arts schools in the nation. "Heading towards this summer and preparing for GSFTA 2018, I am very eager to learn and grow as a musician and student," says Landon Arnold, sophomore percussionist. "I look forward to soaking up all that I can while I'm there!" 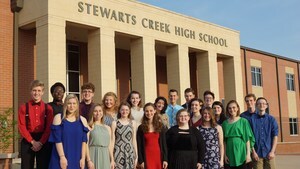 Preparation for Governor's School auditions and portfolio reviews are an integrated part of the Fine Arts curriculum at Stewarts Creek, according to Brian Russell, Choral Director and Chair of the Fine Arts Department. "Students at The Creek push each other toward excellence," says Dr. Russell. "From Athletics to Academics to the Arts; students go above and beyond and celebrate each other's successes." Junior McKenna Harris, pianist, agrees. 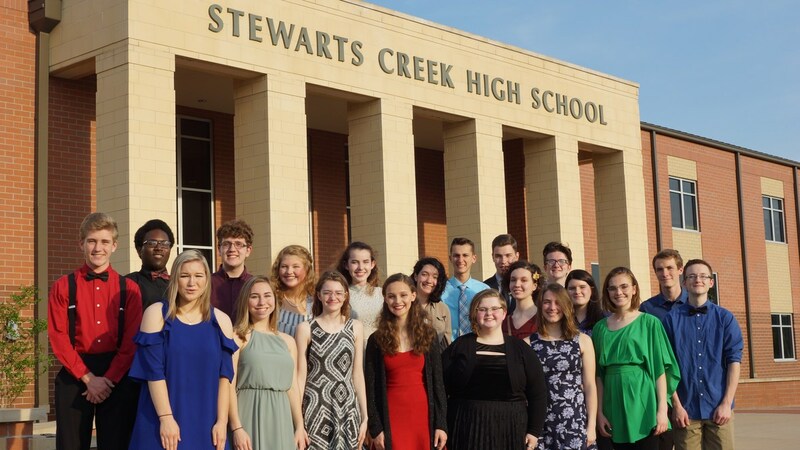 "The Fine Arts education at Stewarts Creek has been an integral part of my music education and overall academic development. I'm thankful for this opportunity and excited for my month at GSFTA." Students will spend four weeks on the campus of MTSU from June 1 through June 23 with nightly performances and daily rehearsals and workshops. More information can be found at www.gsfta.com. Row 3 (left to right): Andre Brown, tuba; Neil Talbott, voice; Sarah Tuverson, theater performance; Nicholas Dauerer, trombone; Landon Arnold, percussion, Kyle Loftus, voice; R. J. Heale, percussion. Not pictured: Dalton Klingbeil, percussion.